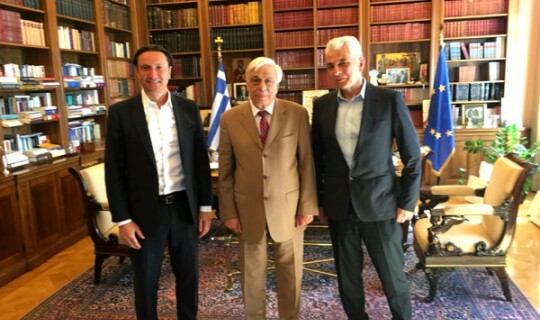 The President of Greece Mr Prokopis Pavlopoulos met with the President of the Greek Community of Melbourne Mr Bill Papastergiadis and the General Secretary Mr Costas Markos, at the Presidential Mansion, on Saturday 1 October. The President was well aware of the Greek of Community of Melbourne’s activities. He said “the organisation is recognised as one of the leading global greek organisations. We are well aware that it has enormous influence with the Australian Government. This is important as it allows the organisation to play a lead role in key social and political matters. Your relationship and influence with Government, I believe, is unique in the global greek diaspora”. The President went on to say to Mr Papastergiadis “we feel proud of the new Cultural Centre that the GCM built. It is a beacon for all greeks no what matter where they reside. This was not an easy achievement. Everyone knows how difficult it was to build a 15 storey Centre”. The President went on to say “However, what we are equally impressed with is the unity that the organisation has achieved in Victoria and Australia. This is important to us in Greece. We respect this immensely. Unity is something that Greeks often have difficulty achieving.”. The President then asked Mr Papastergiadis and Mr Markos to play a pivotal role in the return of the Parthenon Marbles. This is an issue dear to the heart of the President. The President then noted to Mr Papastergiadis “what impresses me about Australia is that it affords people of all backgrounds great opportunities. I have followed your legal career, as I am a lawyer myself, and I am impressed that you have been recognised as one of the top lawyers in Australia and that you are the managing partner of a major firm. This cannot happen in many other countries in such a short space of time. Mr Markos filled in the President on the key issues that the Greek Community of Melbourne sought to pursue. The first issue was the entitlement to vote for greek citizens abroad. This was an important issue as Mr Markos said “for unlocking the goodwill of the diaspora”. The President said “I believe strongly on this issue. I pushed for a law to be passed in parliament 8 years ago. I will raise this issue with the Government”. Mr Markos then referred to the issue of the tourist working visa agreement and the fact that it had not yet been implemented by the Greek Government. The President vowed to raise that issue directly with the responsible minister. Other key issues discussed were cultural exchanges and education retreats and programs for children and teaches. Mr Papastergiadis remarked how taken aback he was by the president’s knowledge of the organisation and also of himself. Mr Papastergiadis said “The President knew all about my legal career and our organisation. He is a very warm and intelligent person. Very insightful individual. The meeting concluded with the President advising that he was always available to the GCM for the pursuit of any issues that were important to Greeks abroad and he was particularly interested in visiting Australia in 2017.